Over 1,500 civil society organisations have created a new political movement in Colombia. Grass roots organisations from the most conflictive rural zones, as well as national trade unions, student groups, leading peace activists and many more, have declared the formation of the Patriotic March: a new social and political actor giving voice to the concerns of some of the most marginalised sectors of Colombian society. How this movement is received and how it is able to develop will have fundamental implications for Colombian politics, and indeed for any possibility of reaching a peaceful resolution to the civil war that has plagued Colombia for almost 50 years. The formation of the Patriotic March Social and Political Movement was declared after a process lasting over two years, in which civil society groups from across the country came together to analyse the most pertinent issues affecting Colombia. In the final weeks of April 2012, the predominantly grass roots led initiative announced its formation as a political platform and mobilised an 80,000 strong rally in the streets of the Colombian capital, Bogotá. The roots of the movement can be traced back to July 2010 when, in the midst of official celebrations of Colombia’s bicentenary, a series of rural and agricultural organisations met to reflect on the actual state of their Colombia. They concluded that they enjoyed neither economic nor political independence, and that what was needed was a ‘second and definitive’ independence. A series of open discussions were organised which saw people from some of the poorest and most conflict-affected regions of the country come to Bogotá to express their views on a range of themes, including national sovereignty, social and economic rights, employment, agrarian issues, the armed conflict and the building of peace with social justice. Cooking on wood fires at the National University. 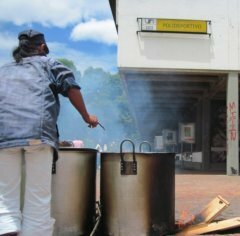 Thousands camped out in the capital’s National University where wood fires were lit to cook communal soups and security was provided by the indigenous guard and student groups. It was the start of a process that continues to develop. The movement now reports to have the support of close to 1,700 organisations.In its opening public statement, in which it revealed the decision of its members to ‘carry out the task of politics for themselves’, the movement laid out its priorities and objectives. At the forefront is the promotion of a negotiated solution to the armed and social conflict in Colombia and, directly related, the need for agrarian reform, a radical change in economic policy, and respect for the right of all Colombians to health, education and work opportunities. It has called out also for mutual cooperation with other grass roots movements and organisations working towards the social transformation of Colombia. Many of the individuals and organisations involved with the Patriotic March have suffered some of the worst consequences of the Colombian conflict. Aside from the economic poverty and the social and political marginalisation that is a common reality for most of those involved in the process, many have also suffered as a direct result of their work in search of peaceful alternatives to the structures and policies that have led to the continuation of one of the world’s longest running civil wars. One organisation central to the development of the Patriotic March has been the ACVC peasant farmer organisation that represents 30,000 local farmers in the Magdalena Medio region of Colombia. As a result of its work in defence of the local peasant farmer community, the ACVC and its members have suffered systematic persecution: in 2007 and 2008 its entire executive committee was arrested on false charges of supporting the guerrillas. All six members were eventually released with no charges ever being made. Andres Gil, who is now spokesman for the Patriotic March, spent almost two years in jail without trial. In spite of continuing defamation attempts against the organisation it won a coveted national peace prize in 2010 in recognition of its work developing alternative rural projects, particularly for its role in the development of a peasant farmer reserve zone in the region. As Gil has commented, ‘achieving peace is not just an issue of guns; structural changes need to be made’. The movement has also gained the support of some key political figures who have been protagonists in the search for peace in Colombia. One of those is the ex-mayor of the Apartadó region, Gloria Cuartas, who during her time as mayor was a vociferous defender of the San Jose de Apartadó Peace Community. As a result of her peace work and her tireless promotion of justice against the abuses carried out in the region, Gloria Cuartas was awarded the first UNESCO Mayors for Peace prize. During her three years in office the young mayor was on the receiving end of countless death threats, and 17 of her colleagues were killed. As Cuartas observed in a still troublingly relevant 1998 interview, ‘Attempts to broker peace in Colombia have been disjointed and scattered. They need to be welded together in a common project, so that the voice of civil society can be heard’. Indeed in spite of the threats and the inherent dangers for all those dedicating themselves to the advancement of peace in Colombia, the commitment to the construction of a just peace remains. The Patriotic March is an important development in this on-going struggle. The Patriotic March gathers an important collection of civil society groups and activists who have been central in the struggle for peace. However it is not only the potential contribution that this group will make that renders its future such an important issue for peace in Colombia; the movement will also serve as a test to see if Colombia is ready to assume the implications of peace. It will demonstrate to all if Colombian society, the Colombian state and indeed the Colombian government has the maturity to welcome pacifically such a united and powerful alternative voice. It will reveal to all whether the current president, Juan Manuel Santos, has the desire or indeed the capacity to confront those who, benefitting from the injustices that so characterise Colombia, continue to use violence and the language of war to suppress any opposition to their personal economic and political interests. How Colombia reacts will reveal if the country is really ready to learn from history and take important steps towards a more peaceful future. It is widely recognised that many of the organisations involved in the Patriotic March come from regions where the armed and social conflict has been most salient: where poverty has been most widespread, where abandonment from the state has been most palpable, and where, somewhat inevitably, the presence of guerrilla groups has been most apparent. It is important therefore, as Leon Valencia the director of the Colombian research institute Nuevo Arco Iris points out, to recognise that some of the social and political objectives of the movement will coincide with those of the guerrillas. This should not lead to an obscuring of the fundamental and vitally important difference: the Patriotic March Social and Political Movement is an open, democratic and civil-society led process. The process must be embraced and welcomed onto the political stage and into society more generally, particularly if such a process can advance the resolution of issues that are at the root of the Colombian conflict. Any attempts to the contrary are ingenuous, dangerous and extremely counter-productive in the effort to advance Colombia on a path towards peace. Still fresh in the memory of many Colombians is the tragedy of the Patriotic Union political party. Although fundamentally different to the new Patriotic March, which, as mentioned above, has emerged as a result of grass roots organising led by civil society organisations, the lessons and potential dangers are clear to see. After peace negotiations held in 1984 between the FARC guerrilla group and the President of the time, Belisario Betancur, a political party was created that allowed for the inclusion of guerrilla members who decided to participate in civilian life. A wide ranging number of groups from civil society joined the political party as its support grew exponentially: in 1986 its candidate received 10% of the vote in the presidential elections. Immediately after its involvement in the electoral process, however, a plan of extermination was initiated against it. The party proved too much of a threat to the interests of the status quo. Between 1986 and 1994 more than 3,000 members and supporters of the party were killed. In 2011 the Colombian state apologised to the family of Manuel Cepeda Vargas, the party’s last senator, for its role in his 1994 murder. This apology comes in the context of a number of subtle changes in Colombia: murmurs of possible peace negotiations are once again being heard. The government’s recognition that an armed conflict exists in Colombia (the existence of an armed conflict was denied by the previous government which inevitably made impossible any talk of peace negotiations) and the recognition that there are victims of state crimes who need some form of reparation have been two important elements to this changed environment. The announcement from the FARC guerrilla group that it has abandoned the practice of economically motivated kidnapping accompanied by the unilateral release of its last remaining political prisoners has been another important factor. This changed environment is both positive and significant. However, some worrying and perhaps ominous signs have already surfaced to remind us that whether Colombia is prepared for the implications of peace is still far from certain. The Patriotic March has already suffered the forced disappearance of a local leader, Hernán Henry Diaz, who was responsible for organising a local affiliated group in the southern Colombian region of Putumayo. This is worrying news both in terms of the individual case and for what it may indicate for the future. Initial reactions to the Patriotic March from certain state officials have also generated cause for concern. Military officials made public allegations that guerrilla groups were funding the creation of the new movement and President Santos himself made implicit references to guerrilla involvement. How the government and wider elements of the Colombian state react is going to have a considerable impact on the future contribution that the movement is able to make. As Leon Valencia correctly observes, ‘this is an important test for the Colombian government’. How it responds will demonstrate how committed it really is to peace in Colombia. The Patriotic March Social and Political Movement has been a stimulating expression of local organising and civil-society led diplomacy. For its part, and if the context permits, the movement must continue to develop without losing sight of the very essence of its strength: its capacity to represent the views and expressions of the most socially and politically marginalised. If able to do so the movement has the potential to become a major factor in the development of peace in Colombia. This would both bring much needed attention to the social concerns that lie behind the conflict’s continuation, and demonstrate to the guerrillas that the fight for social transformation in Colombia can be more effectively advanced in a peaceful and open environment. Of course, if the forced disappearances become systematic, this argument will be far more difficult to make.